SUPER MOM START THE DAY WITH PRAYER!! The SuperMom who leaves the house at 7 a.m. returns at 7 p.m. and cooks dinner while helping her children with their homework is one tired, stressed and burnt out person. 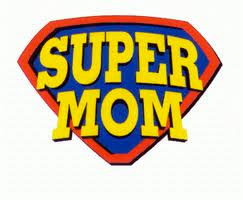 SuperMom 7-7! Is this situation will be the same if they have a husband? I assume that all single mother are also a supermom. Whether they like it or not, they have no choice. Admit it! I am sure your children like the words too..they proud if their mother is a supermom. I never heard any kids called their father as a Superman. Did you? "Mirror, mirror on the wall...I am a supermom after all." if you didn't want to make yourself happy with this statement, just make yourself smile on the mirror. Show good examples to your children, respect yourself and always remember that you are a strong woman. Manage your time wisely. Have a quality time with your children. Always say " I LOVE YOU" to your children. If you haven't start the words before, do practice it. You will see the miracles soon. GA : Kredit to PITI for this articel. Bukan mudah untuk menjadi 'SUPERMOM' sebab anda perlu 'super' kan cara anda berfikir, kesihatan anda dan yang paling penting keimanan anda. Iman kena kuat untuk menepis segala benda yang negatif. Tidak perlu mencari cara yang salah untuk meneruskan kehidupan anda sebab rezeki datangnya dari Allahswt.